A simple & tasty biscuit which the whole family loves. Using an electric mixer, beat butter & brown sugar until pale & creamy. Add egg and beat until just combined. Stir in flour & add NESTLE BAKERS' CHOICE Milk Chocolate Bits, mix until well combined. Roll mixture into balls & place 4cm apart in tray, gently press down on cookies to flatten slightly. Top with NESTLE BAKERS' CHOICE White Chocolate Bits. Bake for 15 minutes or until golden. Set aside on tray for 5 minutes then transfer to wire rack cool. Notes... You can roll into smaller shapes if you prefer a smaller cookie. 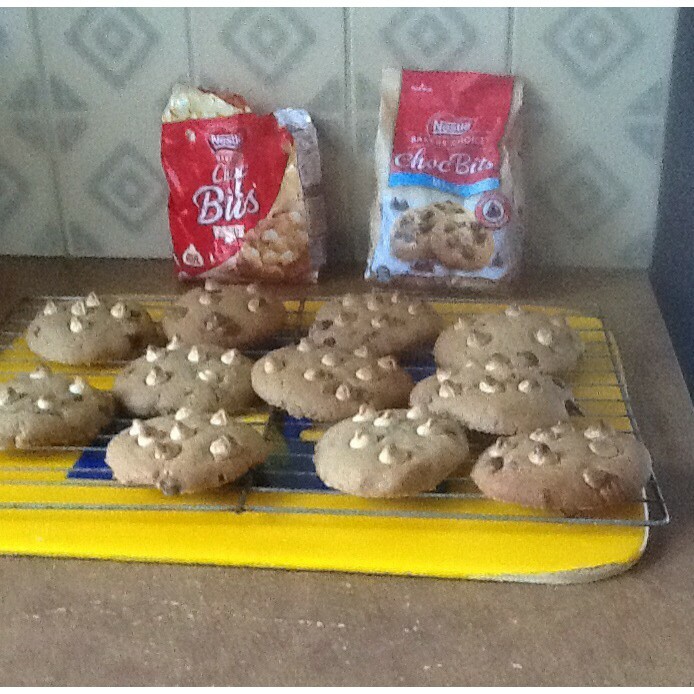 These look very yummy, and great alternative to the traditional choc chip bikkies! Thanks for sharing! Nom nom nom! These look amazing! Oh these are like a double treat! Have always made chocolate chip cookies with just milk chocolate but look forward to trying them with white chocolate, sounds quite yummy. Sweet treat does look really good ,on my must do list . These are so delicious! Yum I! Wow, a whole pack of choc bits! These will get eaten in no time in my house. Like the white chocolate bits too. Delish and so easy to make! Yum! I great, simple biscuit recipe – with lots of chocolate!! simple, quick and easy and the kids loved them!